Which of the following correctly describes the image created by a microscope? The image is real, inverted, and magnified. The image is virtual, inverted, and magnified. The image is real, upright, and magnified. The image is virtual, upright, and magnified. This is College Physics Answers with Shaun Dychko. We want to describe the image created by a microscope. 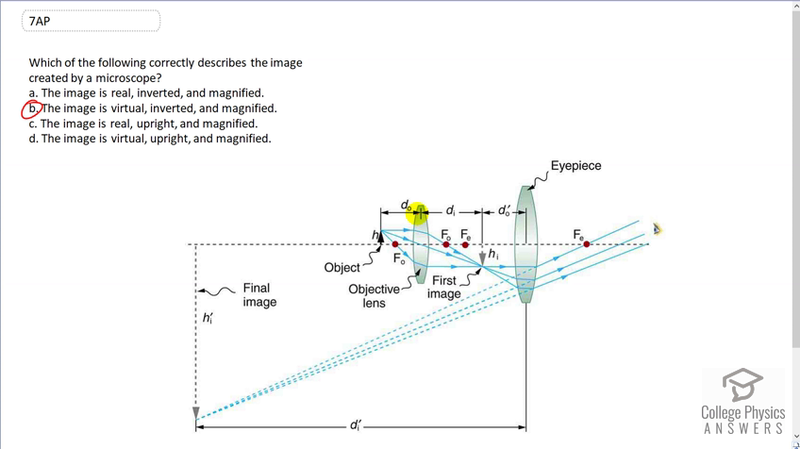 Here's a picture showing the object and there is the objective lens which produces a real image that is inverted here. And then, there's the eyepiece, which produces a virtual image far away from the eyepiece here. And, this virtual image, it's considered virtual because this image is on the same side of the eyepiece lens as the object is. This being the image for the first lens that it's considered to be the object with respect to the second lens. And, we can see that this final image is inverted compared to the object. And, it's virtual because it's on the same side of the lens as the object is to the eyepiece. And, it's magnified because it's bigger than the object is. So, the answer is B.